Walden (first published as Walden; or, Life in the Woods) by Henry David Thoreau is one of the best-known non-fiction books written by an American. 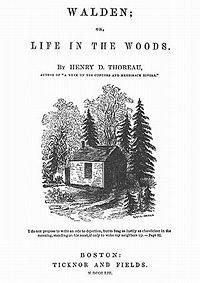 Published in 1854, it details Thoreau's sojourn in a cabin near Walden Pond, in a woodland owned by his friend and mentor Ralph Waldo Emerson, near Concord, Massachusetts. Thoreau hoped to isolate himself from society in order to gain a more objective understanding of it. Simplicity and self-reliance were Thoreau's other goals, and the project was inspired by the Transcendentalist philosophy Thoreau inherited mainly from Emerson. Thoreau lived at Walden for two years, two months, and two days, but Walden was written so that the stay appears to be a year, with corresponding seasonal divisions. Walden is thus neither a novel nor an autobiography, but combines elements of both to create a compelling social critique of the Western world, with each chapter heralding some aspect of humanity that Thoreau felt needed to be either renounced or praised. Thoreau did not live there as a hermit, went often to Concord, received visitors, and returned their visits. 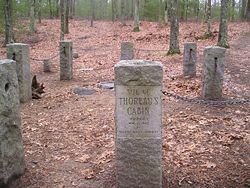 Thoreau also wrote about the experience at Walden Pond itself, commenting on the plants and animals as well as the way people treated him for living there, using those experiences to bring out his philosophical positions. Walden has inspired Walden Three, a foundation that promotes sustainable societies; a wildlife-preservation movement; and the 1948 novel Walden Two by psychologist B.F. Skinner. Now an icon for environmentalists, Thoreau's classic has become a symbolic goal for Americans seeking to "get in touch with nature." 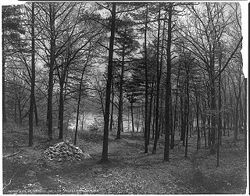 The site of Thoreau's cabin in 1908. Economy: Thoreau begins by outlining his project: a two-year and two-month stay at a rude cabin in the woods near Walden Pond. He does this, he says, in order to illustrate the spiritual benefits of a simplified lifestyle. He easily supplies the four necessities of life (food, shelter, clothing, and fuel). He meticulously records his expenditures and earnings, demonstrating his understanding of "economy," as he builds his house and buys and grows food. For a home and freedom, he spends a mere $25.00. Complementary Verses: This chapter consists entirely of a poem, "The Pretensions of Poverty," by seventeenth-century English poet Thomas Carew. The poem criticizes those who think that their poverty gives them some sort of unearned moral and intellectual superiority. Where I Lived, and What I Lived For: After playing with the idea of buying a farm, Thoreau describes his cabin's location. He explains that he took up his abode at Walden Woods so as to "live deliberately, to front only the essential facts of life, and see if I could not learn what it had to teach, and not, when I came to die, discover that I had not lived." Reading: Thoreau discourses on the benefits of reading classical literature (preferably in the original Greek or Latin) and bemoans the lack of sophistication in nearby Concord, manifested in the popularity of popular literature. He yearns for a utopian time when each New England village will support "wise men" to educate and thereby ennoble the population. The home of Ralph Waldo Emerson in Concord, where Thoreau was a frequent visitor. Sounds: Thoreau warns against relying too much on literature as a means of transcendence. Instead, one should experience life for oneself. After describing his cabin's beautiful natural surroundings and his casual housekeeping habits, Thoreau goes on to criticize the train whistle that interrupts his reverie. To him, the railroad symbolizes the destruction of the good old pastoral way of life. Other sounds audible from his cabin include: the church bells ringing, carriages rattling and rumbling, cows lowing, whippoorwills singing, owls hooting, frogs croaking, and cockerels crowing. Solitude: Thoreau rhapsodizes about the beneficial effects of living solitary and close to nature. He loves to be alone, for "I never found the companion that was so companionable as solitude," and he is never lonely as long as he is close to nature. He believes there is no great value to be had by rubbing shoulders with the mass of humanity. Visitors: Thoreau writes about the visitors to his cabin. Among the 25 or 30 visitors is a runaway slave whom Thoreau helps on his journey to freedom in Canada, and a young Canadian woodchopper, whom Thoreau sees as approaching the ideal man. Animals and birds such as this loon were among Thoreau's companions at Walden Pond. The Bean-Field: Thoreau relates his efforts to cultivate two and a half acres of beans. He plants in June and spends his summer mornings weeding the field with a hoe. He sells most of the crop, and his small profit of $8.71 covers his needs. The Village: Thoreau visits the small town of Concord every day or two to hear the news, which he finds "as refreshing in its way as the rustle of the leaves." Nevertheless, he contemptuously compares Concord to a gopher colony. In late summer, he is arrested for refusing to pay federal taxes, but is released the next day. He explains that he refuses to pay taxes to a government that supports slavery. The Ponds: In autumn, Thoreau rambles about the countryside and writes down his observations about the geography of Walden Pond and its neighbors: Flint's Pond (or Sandy Pond), White Pond, and Goose Pond. Although Flint's is the largest, Thoreau's favorites are Walden and White ponds. They are lovelier than diamonds, he says. Baker Farm: While on an afternoon ramble in the woods, Thoreau gets caught in a rainstorm and takes shelter in the dirty, dismal hut of John Field, a penniless but hard-working Irish farmhand, and his wife and children. Thoreau urges Field to live a simple but independent and fulfilling life in the woods, thereby freeing himself of employers and creditors. But the Irishman won't give up his dreams of luxury, which is the American dream. 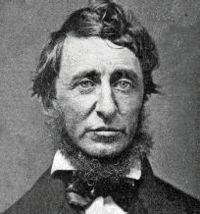 Higher Laws: Thoreau discusses whether hunting wild animals and eating meat is good. He concludes that the primitive, animal side of humans drives them to kill and eat animals, and that a person who transcends this propensity is superior. (Thoreau himself eats fish but not meat.) In addition to vegetarianism, he lauds chastity, work, and refraining from alcoholic beverages. Brute Neighbors: Thoreau briefly discusses the many wild animals that are his neighbors at Walden. A description of the nesting habits of partridges is followed by a fascinating account of a massive battle between red and black ants. Three of the combatants he takes into his cabin and examines them under a microscope as the black ant kills the two smaller red ones. Later, Thoreau takes his boat and tries to follow a teasing loon about the pond. House-Warming: After picking November berries in the woods, Thoreau bestirs himself to add a chimney and plaster the walls of his hut in order to stave off the cold of the oncoming winter. He also lays in a good supply of firewood, and expresses affection for wood and fire. Former Inhabitants; and Winter Visitors: Thoreau relates the stories of people who formerly lived in the vicinity of Walden Pond. Then he talks about the few visitors he receives during the winter: a farmer, a woodchopper, and a poet (Emerson). Winter Animals: Thoreau amuses himself by watching wildlife during the winter. He relates his observations of owls, hares, red squirrels, mice, and various birds as they hunt, sing, and eat the scraps and corn he puts out for them. He also describes a foxhunt that passes by. 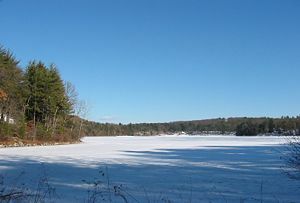 The Pond in Winter: Thoreau describes Walden Pond as it appears during the winter. He claims to have sounded its depths and located an underground outlet. He recounts how 100 laborers came to cut great blocks of ice from the pond, to be shipped to the Carolinas. Spring: As spring arrives, the ice of Walden and the other ponds melts with loud thundering and rumbling. Thoreau enjoys watching the thaw, and grows ecstatic as he witnesses the green rebirth of nature. He watches the geese winging their way north, and a hawk playing by itself in the sky. As nature is reborn, the narrator implies, so is he. He departs Walden on September 8, 1847. Conclusion: This final chapter is more passionate and urgent than its predecessors. In it, Thoreau criticizes Americans' constant rush to succeed, to acquire superfluous wealth that does nothing to augment their happiness. He urges them to change their lives for the better, not by acquiring more wealth and material possessions, but instead to "sell your clothes and keep your thoughts," and to "say what you have to say, not what you ought." He criticizes conformity: "If a man does not keep pace with his companions, perhaps it is because he hears a different drummer. Let him step to the music which he hears, however measured or far away." By doing these things, men may find happiness and self-fulfillment. 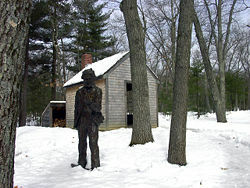 A reproduction of Thoreau's cabin with a statue of Thoreau. Walden was inspired by the philosophy of American Transcendentalism, developed by Thoreau's friend and spiritual mentor Ralph Waldo Emerson. Emerson owned the land on which Thoreau built his cabin at Walden Pond, and Thoreau used to walk over to Emerson's house for a meal and a conversation. Walden emphasizes the importance of self-reliance, solitude, contemplation, and closeness to nature in transcending the crass existence that is supposedly the lot of most humans. The book is neither a novel nor a true autobiography, but combines these genres with a social critique of contemporary Western culture's consumerist and materialist attitudes and its distance from and destruction of nature. Not simply a criticism of society, Walden is also an attempt to engage creatively with the better aspects of contemporary culture, as suggested both by Thoreau's proximity to Concord society and his admiration for classical literature. Thoreau regarded his sojourn at Walden as a noble experiment with a threefold purpose. First, he was escaping the dehumanizing effects of the Industrial Revolution by returning to a simpler, agrarian lifestyle. Second, he was simplifying his life and reducing his expenditures, increasing the amount of leisure time in which he could work on his writings. Third, and most important, Thoreau was putting into practice the Transcendentalist belief that one can best transcend normality and experience the Ideal, or the Divine, through nature. It should come as no surprise that Walden is now an icon for environmentalists and a touchstone for Americans seeking to "get in touch with nature." Walden started a movement for less pollution and preserving wildlife—a movement that has grown to significant proportions in American politics today. Walden inspired the 1948 novel Walden Two by psychologist B.F. Skinner. Walden Three, a non-profit educational foundation that promotes sustainable societies, takes its name from the book. All links retrieved October 15, 2016. Download complete text from Project Gutenberg www.gutenberg.org. Read the complete text online publicliterature.org. This page was last modified on 15 October 2016, at 14:52.